Traditional parse trees are combined together and enriched with anaphora and rhetoric information to form a unified representation for a paragraph of text. We refer to these representations as parse thickets. They are introduced to support answering complex questions, which include multiple sentences, to tackle as many constraints expressed in this question as possible. The question answering system is designed so that an initial set of answers, which is obtained by a TF*IDF or other keyword search model, is re-ranked. Passage re-ranking is performed using matching of the parse thickets of answers with the parse thicket of the question. To do that, a graph representation and matching technique for parse structures for paragraphs of text have been developed. We define the operation of generalization of two parse thickets as a measure of semantic similarity between paragraphs of text to be the maximal common sub-thicket of these parse thickets. 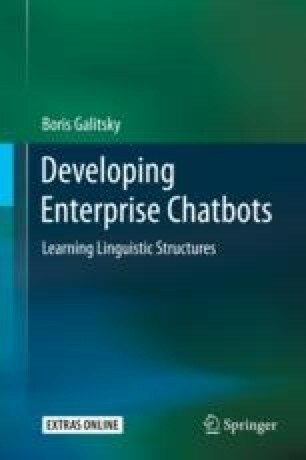 Passage re-ranking improvement via parse thickets is evaluated in a variety of chatbot question-answering domains with long questions. Using parse thickets improves search accuracy compared with the bag-of words, the pairwise matching of parse trees for sentences, and the tree kernel approaches. As a baseline, we use a web search engine API, which provides much more accurate search results than the majority of search benchmarks, such as TREC. A comparative analysis of the impact of various sources of discourse information on the search accuracy is conducted. An open source plug-in for SOLR is developed so that the proposed technology can be easily integrated with industrial search engines.